Bone Broth Protein Powder Ginger is great by itself or mixed with your favourite soup, sauce, or stew. Made locally, enjoyed world-wide. Ginger Bone Broth that saves you time and money. Tastes great, convenient, easy to use powder in hot water, and recipes. So far so good ! Tastes great just by itself with a little salt. I've added it to soups and gravies - adds a nice flavour. Highly recommend ! Great product! The ginger flavour is a little strong, just mix a little less than directions and add salt and pepper. Soothing drink! Quick and easy way to get in my daily dose of iron, protein, and collagen. This product doesn't taste amazing on its own but, if you add some salt and pepper it becomes a soothing broth. Awful taste. The ginger is overwhelmingly strong, and burns my throat. I LOVE the regular chicken bone broth by Organika, so I'm really perplexed. Also, it's clumpy in hot water. I think I got a really bad batch, it's almost undrinkable. Great way to get extra protein in your diet. Love the taste and it's mixability. I really love this product. Having something so convenient to make that is nutritious and made with clean simple ingredients is truly a relief. Iâ€™ll have a cup when Iâ€™m feeling cold, looking for comfort and donâ€™t want a coffee/tea or full meal, with a splash of fresh lemon juice and a dash of salt, or I add it to a homemade soup when one of us has the sniffles. Itâ€™s a wonderful product and something I will always keep in the kitchen pantry! Great tasting broth. Easily dissolves and the ginger adds a nice bit of flavour & added nutritional value. 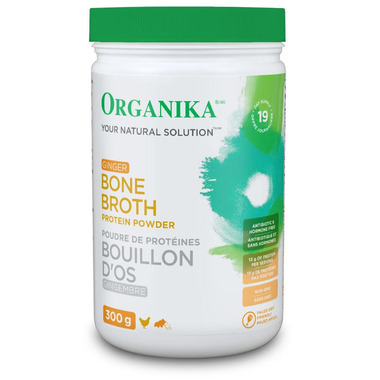 This bone broth powder dissolves instantly and is flavourful ! I enjoy a mid afternoon cupful. It's quite satisfying.